Clinical images of chondrodermatitis nodularis chronica helicis are below. Classic chondrodermatitis nodularis chronica helicis on the superior helix. Close-up view of classic chondrodermatitis nodularis chronica helicis. The cause of chondrodermatitis nodularis chronica helicis is not certain; however, pressure, cold, actinic damage, and repeated trauma have been implicated. Sleeping on the affected side is usually an important etiologic factor. Injury to the underlying cartilage and/or skin from pressure appears to be a primary etiologic factor. In cases of chondrodermatitis nodularis chronica helicis associated with systemic autoimmune disorders, evidence indicates that microvascular injury may be an important underlying cause. Interestingly, in one such patient, chondrodermatitis nodularis chronica helicis was the first clinical manifestation of the patient’s autoimmune disorder. Local factors, such as pressure and repeated trauma, likely compound the microvascular injury and subsequent ischemia of the underlying cartilage involved in chondrodermatitis nodularis chronica helicis. Chondrodermatitis nodularis chronica helicis occurs most commonly in fair-skinned individuals with severely sun-damaged skin; however, it can occur in persons of any races. Although chondrodermatitis nodularis chronica helicis mostly occurs in men, 10-35% of cases involve women. Chondrodermatitis nodularis chronica helicis can occur in patients of any age but mostly affects middle-aged to older individuals. Age at onset is similar in men and women. The prognosis for patients with chondrodermatitis nodularis chronica helicis (CNH) is excellent, although long-term morbidity is common. Spontaneous resolution is the exception; remissions may occur, but chondrodermatitis nodularis chronica helicis usually continues unless adequately treated. Rex J, Ribera M, Bielsa I, Mangas C, Xifra A, Ferrándiz C. Narrow elliptical skin excision and cartilage shaving for treatment of chondrodermatitis nodularis. Dermatol Surg. 2006 Mar. 32 (3):400-4. [Medline]. Grigoryants V, Qureshi H, Patterson JW, Lin KY. Pediatric chondrodermatitis nodularis helicis. J Craniofac Surg. 2007 Jan. 18(1):228-31. [Medline]. Tsai TH, Lin YC, Chen HC. Infantile chondrodermatitis nodularis. Pediatr Dermatol. 2007 May-Jun. 24(3):337-9. [Medline]. Upile T, Patel NN, Jerjes W, Singh NU, Sandison A, Michaels L. Advances in the understanding of chondrodermatitis nodularis chronica helices: the perichondrial vasculitis theory. Clin Otolaryngol. 2009 Apr. 34(2):147-50. [Medline]. Chan HP, Neuhaus IM, Maibach HI. Chondrodermatitis nodularis chronica helicis in monozygotic twins. Clin Exp Dermatol. 2009 Apr. 34(3):358-9. [Medline]. Newcomer VD, Steffen CG, Sternberg TH, Lichtenstein L. Chondrodermatitis nodularis chronica helicis; report of ninety-four cases and survey of literature, with emphasis upon pathogenesis and treatment. 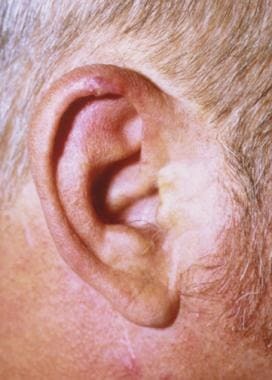 AMA Arch Derm Syphilol. 1953 Sep. 68(3):241-55. [Medline]. Magro CM, Frambach GE, Crowson AN. Chondrodermatitis nodularis helicis as a marker of internal disease [corrected] associated with microvascular injury. J Cutan Pathol. 2005 May. 32(5):329-33. [Medline]. 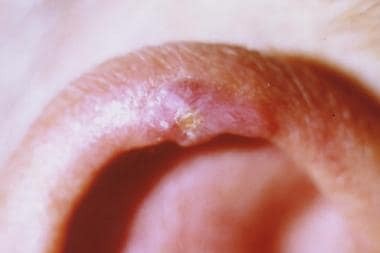 Oelzner S, Elsner P. Bilateral chondrodermatitis nodularis chronica helicis on the free border of the helix in a woman. J Am Acad Dermatol. 2003 Oct. 49(4):720-2. [Medline]. Cribier B, Scrivener Y, Peltre B. Neural hyperplasia in chondrodermatitis nodularis chronica helicis. J Am Acad Dermatol. 2006 Nov. 55(5):844-8. [Medline]. Elsensohn A, Getty S, Shiu J, de Feraudy S. Intradermal Proliferative Fasciitis Occurring With Chondrodermatitis Nodularis Helicis. Am J Dermatopathol. 2018 Feb. 40 (2):139-141. [Medline]. Juul Nielsen L, Holkmann Olsen C, Lock-Andersen J. Therapeutic Options of Chondrodermatitis Nodularis Helicis. Plast Surg Int. 2016. 2016:4340168. [Medline]. Moncrieff M, Sassoon EM. Effective treatment of chondrodermatitis nodularis chronica helicis using a conservative approach. Br J Dermatol. 2004 May. 150(5):892-4. [Medline]. Travelute CR. Self-adhering foam: a simple method for pressure relief during sleep in patients with chondrodermatitis nodularis helicis. Dermatol Surg. 2013 Feb. 39(2):317-9. [Medline]. Flynn V, Chisholm C, Grimwood R. Topical nitroglycerin: a promising treatment option for chondrodermatitis nodularis helicis. J Am Acad Dermatol. 2011 Sep. 65(3):531-6. [Medline]. Garrido Colmenero C, Martínez García E, Blasco Morente G, Tercedor Sánchez J. Nitroglycerin patch for the treatment of chondrodermatitis nodularis helicis: a new therapeutic option. Dermatol Ther. 2014 Sep-Oct. 27(5):278-80. [Medline]. García-Malinis AJ, Turrión-Merino L, Pérez-García B, Saceda-Corralo D, Harto-Castaño A, Gilaberte Y. Observational study of chondrodermatitis nodularis helicis treated with methyl aminolevulinate photodynamic therapy. J Am Acad Dermatol. 2017 Jun. 76 (6):1103-1108. [Medline]. Salah H, Urso B, Khachemoune A. Review of the Etiopathogenesis and Management Options of Chondrodermatitis Nodularis Chronica Helicis. Cureus. 2018 Mar 26. 10 (3):e2367. [Medline]. Kromann N, Hoyer H, Reymann F. Chondrodermatitis nodularis chronica helicis treated with curettage and electrocauterization: follow-up of a 15-year material. Acta Derm Venereol. 1983. 63(1):85-7. [Medline]. Gilaberte Y, Frias MP, Pérez-Lorenz JB. Chondrodermatitis nodularis helicis successfully treated with photodynamic therapy. Arch Dermatol. 2010 Oct. 146(10):1080-2. [Medline]. Shah S, Fiala KH. Chondrodermatitis nodularis helicis: A review of current therapies. Dermatol Ther. 2017 Jan. 30 (1):[Medline]. Lawrence CM. The treatment of chondrodermatitis nodularis with cartilage removal alone. Arch Dermatol. 1991 Apr. 127(4):530-5. [Medline]. Affleck AG. Surgical treatment of chondrodermatitis nodularis chronica helicis: conservation of normal tissue is important for optimal esthetic outcome. J Oral Maxillofac Surg. 2008 Oct. 66(10):2194. [Medline]. Yaneza MM, Sheikh S. Chondrodermatitis nodularis chronica helicis excision and reconstruction. J Laryngol Otol. 2013 Jan. 127(1):63-4. [Medline]. Rajan N, Langtry JA. The punch and graft technique: a novel method of surgical treatment for chondrodermatitis nodularis helicis. Br J Dermatol. 2007 Oct. 157(4):744-7. [Medline]. Cognetta AB Jr, Wolfe CM, Green WH, Hatfield HK. Triangular window technique: a novel approach for the surgical treatment of chondrodermatitis nodularis helicis. Dermatol Surg. 2012 Nov. 38(11):1859-62. [Medline]. Ramsey ML, Marks VJ, Klingensmith MR. The chondrocutaneous helical rim advancement flap of Antia and Buch. Dermatol Surg. 1995 Nov. 21(11):970-4. [Medline]. Chondrodermatitis nodularis chronica helicis on the antihelix. Taken during surgery, this photo demonstrates reflection of the skin, which reveals the underlying perichondrium and cartilage. After the cartilage is removed, the flap is reapproximated and sutured. Taken 6 months after surgery. Self-adhering foam in a curvilinear shape is placed on the non–hair-bearing postauricular scalp. A rectangular piece of self-adhering foam is placed on the non–hair-bearing postauricular scalp.